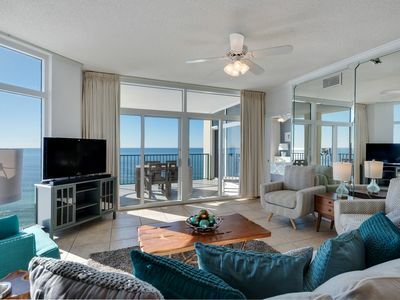 Destin-ation Penthouse! 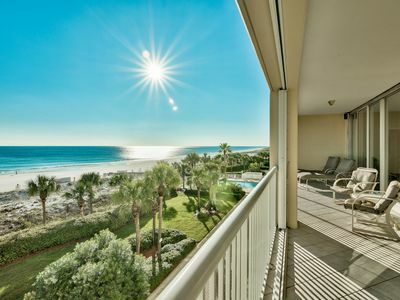 Endless Panoramic Gulf Views From Top East End View! 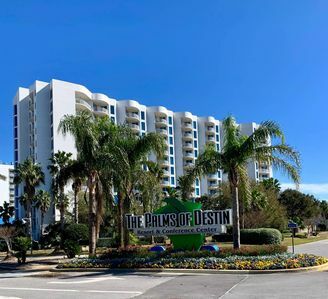 Dunes of Crystal Beach 401 is Professionally Managed by Newman-Dailey. 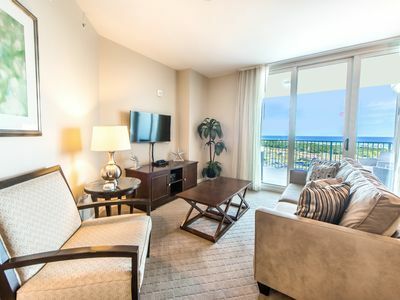 Elegantly modern, Dunes of Destin 401 sits as a queen in a sea of vacation rentals. 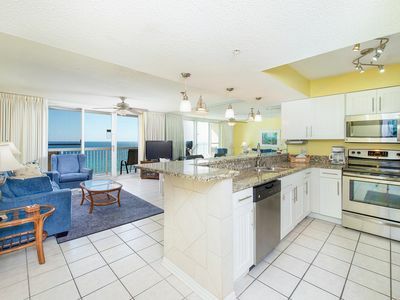 A stunningly large beachfront condo, its five bedrooms, chef-ready kitchen and forty foot balcony brim with upgrades as the Gulf does with fish. Arched entryways welcome you to tall ceilings with inset lighting, intriguingly abstract art decks the sand-colored walls and plush designer furnishings add warmth to the cool yet lustrous travertine floors. Like any good monarch, 401 is an excellent host. 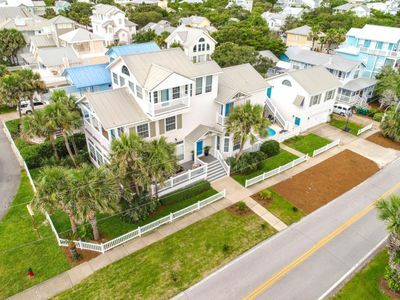 Four of the five bedrooms feature balconies with beautiful views of Destin or the beach along with superb interior design. 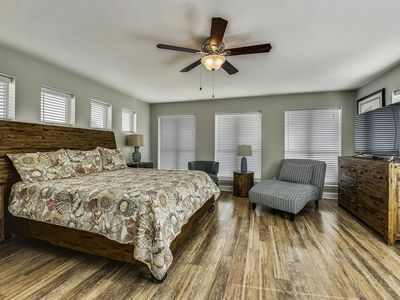 In fact, the master suite is incredibly spacious and boasts hardwood flooring as well as a bathroom with double vanities, an oversized jetted tub and a stone walk-in shower. 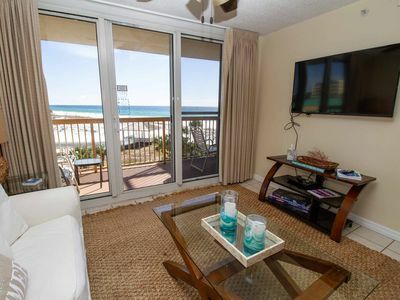 Undoubtedly, this Destin vacation condo enjoys unmatched beach views from its furnished balcony and large windows along with magazine-worthy decor... but its power to impress foes further! Conveniences like a huge laundry room, elevator access, covered parking, a grilling area, a sunny pool and spa deck along with a fantastic location nearby plenty of entertainment options, including Camille's Coffee Shop, will make any tenant a happy subject to its queenly qualities. Entering this beautiful 5br penthouse, you are greeted by travertine floors leading to a unique octangular Foyer. Just before the Foyer, bedroom #5 is set up w/a nautical theme w/2 TWINS (Daybed + trundle combo). The spacious Foyer is centrally located and holds your choice of (3) additional bedrooms (bedroom #4 (QUEEN), bedroom #3 (KING) or Bedroom #2 (QUEEN) along with a shared full guest bath. Bedroom #4 shares this bath with bedroom #5 and has access to a spacious long balcony that looks over the Crystal Beach community. Or, choose bedroom #3 (KING) that has its own full bath and again shares the spacious long balcony with Bedroom #4. Lastly, there is Bedroom #2 (QUEEN). 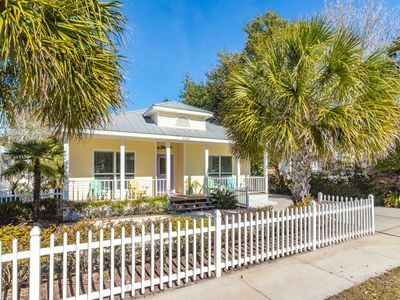 It also has its own full bath and has a PRIVATE balcony that enjoys wonderful Gulf views and views of the surrounding Crystal Beach community. 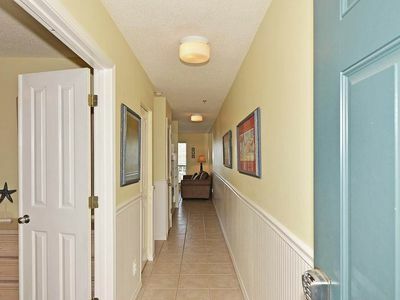 Next, go down the long hallway that leads to the Gulf front great room & Gulf front master bedroom. On the way, you will pass the large laundry room that boasts a brand new Samsung washer & dryer and a mud sink perfect for washing bathsuits. 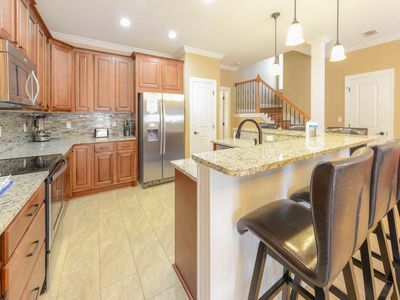 The Great room features a fully stocked gourmet kitchen that consists of granite countertops, under cabinet lighting, large fridge, gas range, separate ice machine and long breakfast bar. The breakfast bar holds (4) bar stools and sits adjacent to the large dining table that seats (8) . Completing the Great room is the living area that has a colorful sectional w/a sleeper sofa (QUEEN). There is a unique coffee table that converts into a child's table w/(4) mini seats ideal for kids dining or craft area. 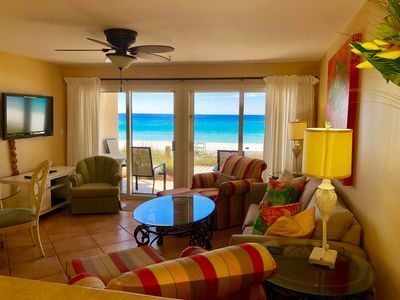 VIEWS, VIEWS, VIEWS, Regardless of where you are in the Great room, the advantage of this East end unit Penthouse are the expansive Gulf views because of the extra windows in dining & living areas. 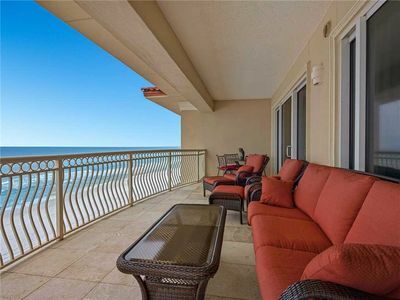 Of course the views are incredible from the inside but the beachside balcony views are superior to any. 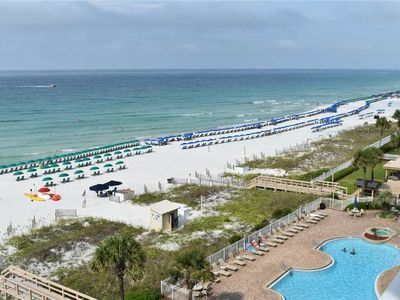 Expansive panoramic Gulf views will highlight your stay from sunrise to sunset. This magnificent sized balcony has enough seating to accommodate all guests, includes a table for dining and lounge chairs for long naps. This huge balcony runs the width of the penthouse and wraps around the side of living area for even more viewing opportunities. 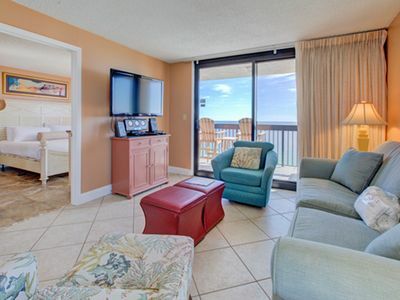 Finally, bedroom #1 (KING) is the Master suite located on the Gulf side w/direct access to this large balcony. 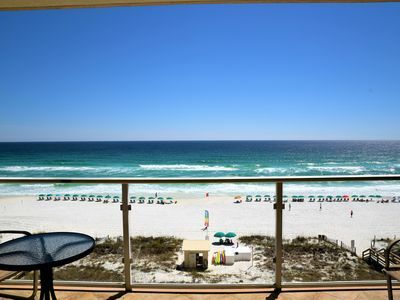 Imagine waking up to the beautiful Emerald waters of the Gulf of Mexico everyday without moving out of your bed. The master suite boasts (2) large closets and a very spacious bathroom. Master bath has separate granite vanities, travertine flooring, travertine walk-in shower and a separate bath tub ready for a long soak. 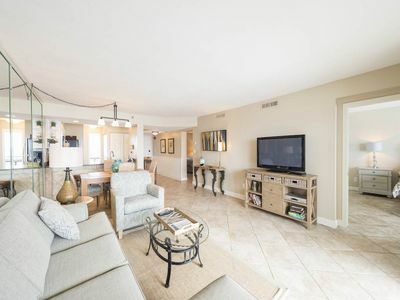 1) The East end location of this penthouse is directly above the on-site pool, hot tub and BBQ grills areas so you can communicate with any parties located at these areas directly from the penthouse. 2) Two reserved covered parking spots in underneath garage near elevator lobby. 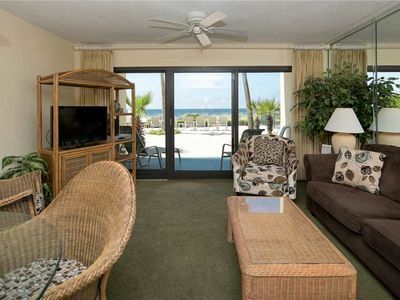 5) Dunes of Crystal Beach is a low density, private, gated condominium w/only 20 condo units total. 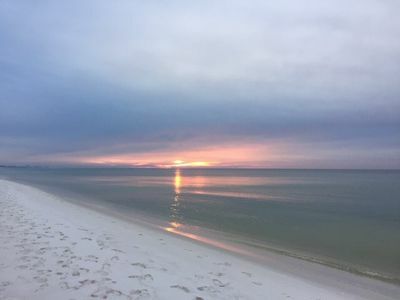 6) 250 ft of beach to relax and located near the West end of Scenic Hwy 98 where there is minimal traffic surrounding the property and 3 miles of protected beach State park. 7) Grocery stores, shopping, bike rentals, coffee shop and an abundance of restaurants w/in 1 mile of property. During Spring and Summer this condo requires a 7-night, Saturday to Saturday stay. Holidays have a four-night minimum. Any other time we require a 3-night minimum stay. Blue Marlin - Booking spring vacays, now! 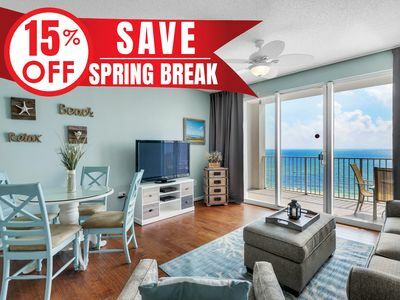 Emerald Towers 702 - Book your spring getaway! 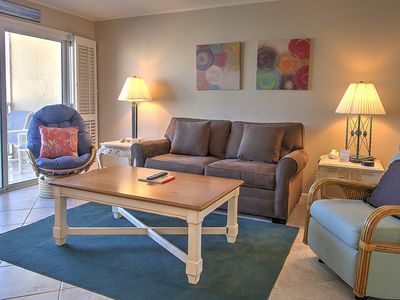 SunDestin 1712 - Book your spring getaway!